- 600 swabs / 300 sticks in a Plastic Jar. Stick Color: Blue, Pink, Yellow etc. We are ranked on top by offering the best quality is known for its remarkable finish and quality of Cotton Ear Bud. We are one of the most reliable companies in this domain and are into offering Cotton Plastic Stick Bud. 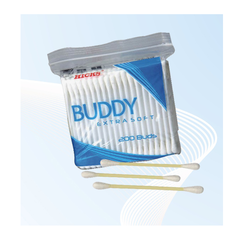 With a firm commitment to quality, we are involved in offering a wide ambit of Plastic Stick Cotton Bud. At Sanemi, we provide ribbed & smooth plastic sticks that are used by Trusted Suppliers globally to produce the finest quality of Cotton buds/ Swabs. Cosmedik Inc is sole selling distributor in India for Clinere. The Eye Tees Applicators from 3RB are perfect for blending or gentle cleaning so you can get precision makeup application. We are a top-notch organization, engaged in providing Plastic Stick Cotton Bud.